Saintly visit: Cardinal Karol Wojtyla presiding at a Mass at Bowen Hills in 1973. While Archbishop of Krakow, Cardinal Wojtyla was assigned to care for Polish Catholics around the world, including members of the Bowen Hills parish at Our Lady of Victories. A BRISBANE parish that welcomed St John Paul II before he was elected pope will host a Eucharistic procession to honour the Marian apparition he claimed saved his life. Our Lady of Victories Parish in Bowen Hills, which received a visit from St John Paul II in 1973 when he was Archbishop of Krakow, will commemorate the first apparition of Our Lady of Fatima exactly 100 years after she appeared to three shepherd children. 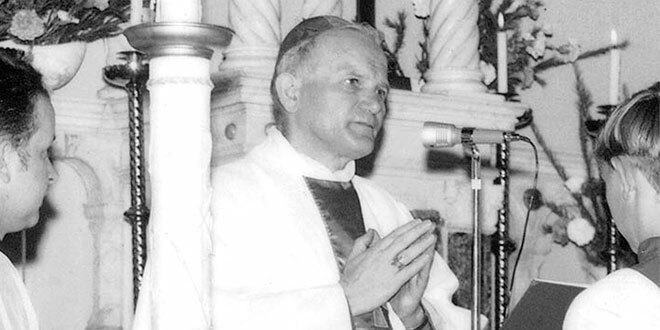 Pope John Paul II claimed the intercession of Our Lady of Fatima had saved him from an assassination attempt by Turkish man Mehmet Ali Agca in 1981, who shot the pontiff four times in a crowded St Peter’s Square. The failed assassination took place exactly 64 years after Our Lady of Fatima first appeared to three shepherd children on May 13, 1917. The pope publicly forgave his shooter and in 1983 the Holy Father visited Mr Agca in his jail cell. He also gave one of the bullets that wounded him to the bishop in charge of Fatima, and the bullet is now in the crown of the statue of Our Lady of Fatima. Parish priest Fr Andrzej Kołaczkowski, who is originally from Poland, has invited all Catholics in Brisbane archdiocese to his parish on May 13 for the centenary of Our Lady of Fatima. Bowen Hills parishioners have honoured Our Lady of Fatima for 20 years, praying in a Rosary procession outside the church that follows a statue of Our Lady of Fatima. 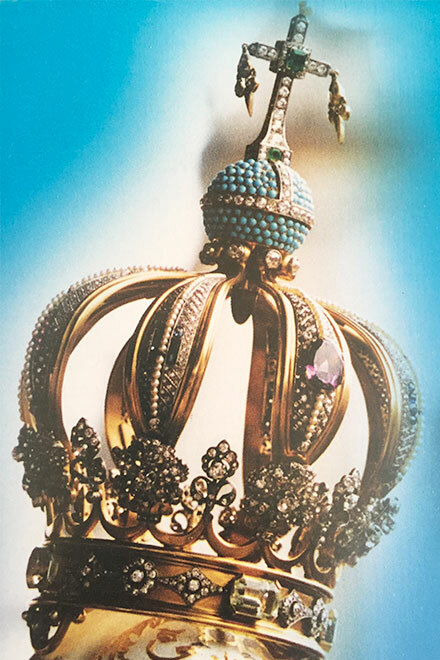 Remembering the intercession: A close-up of the crown of Our Lady of Fatima showing the mounted bullet that wounded Pope John Paul II in a failed assassination. On May 13, which marks 100 years since Our Lady of Fatima appeared, the parish will host a Eucharistic procession. “To mark this special occasion, however, we will give the first place of honour to Our Lord Himself in the Blessed Sacrament, which is very fitting since the Eucharist is central to the Fatima message,” Fr Kołaczkowski said. Priests will hear confessions between 5 and 7pm before Mass at 7.15pm. Mass will be followed by the Eucharistic procession. The church doors will be kept open after Mass for all-night adoration. People can also be enrolled in the Brown Scapular on the night. Fr Kołaczkowski expected a packed church for the centenary celebrations, and confirmed at least 10 seminarians from Holy Spirit Seminary would join in for three hours of Eucharistic adoration. “We’ve even heard that some people are thinking of travelling from interstate to join in the celebrations,” he said. From May 13 the parish will also offer a small pilgrim statue of Our Lady of Fatima that will be available for families to adopt for one week. Fr Kołaczkowski said the strong devotion to Our Lady of Fatima in his parish came from the parishioners. “I think it’s one of those celebrations that comes from the grassroots level,” he said. The community’s special connection with St John Paul II and the prayers of the current Pope will also be central to this year’s celebrations. “I invite everyone to attend and unite in spirit with the current Holy Father Pope Francis who will be celebrating in Fatima, as well as with St John Paul II from his place in heaven,” Fr Kołaczkowski said.